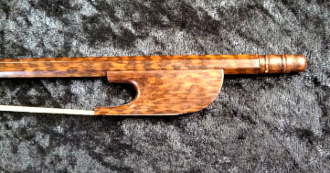 This full size baroque violin bow for sale was made in Europe c 2000. It has no identifying markings. It is made entirely of snakewood and has made standard baroque bow characteristics. This Baroque Violin Bow has an elongated tip and elongated frog. It handles well for a non-standard violin bow and does create the sound of a baroque instrument. This bow has been gently used in the past and is in excellent condition. At $400.00, a violinist who is looking for an inexpensive baroque bow would find this bow to be quite suitable.